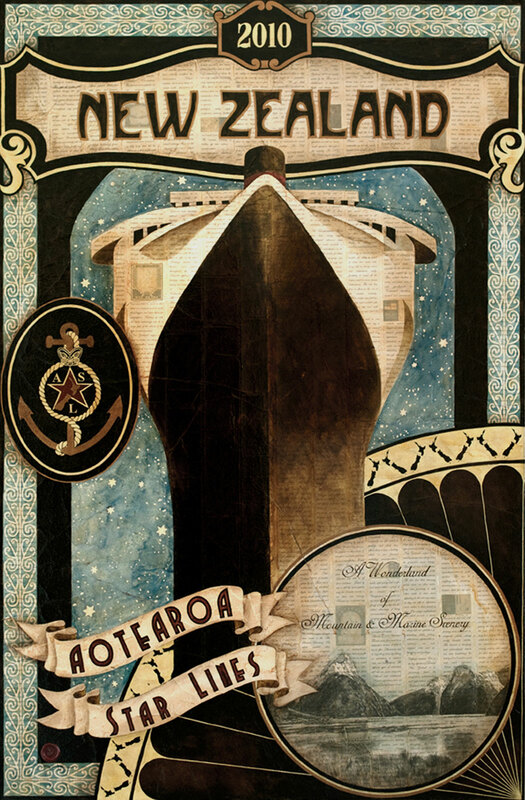 The Aotearoa Star Lines art works are a tribute to the Union Steam Ship Company of New Zealand. Ship: The Awatea (Eye of the Dawn) was built in 1936 and it brought a taste of the glamorous and luxurious cruise liners from early 20th Century. Kowhaiwhai (scroll design): The inspiration for this Kowhaiwhai comes from Ngaru, a traditional Maori design representing the cutting of the waves as the ‘waka’ moves through them. Aotearoa Star Lines Logo: (star & rope): Combination of red star with white boarder from the New Zealand flag; the rope and New Zealand inspired by New Zealand Ship and Marine society’s logo; and the anchor, symbol of all things connected with the ocean. Wellington Harbour Board Logo: (fish & turret): This design was taken from the outside of shed 13 building which was originally a bond store for early shipping in Wellignton. Boarder Design: Inspired by the detailing on the outside of Shed 13.